Recently my business partner Steve wrote a post about Zappos generating more than 1 billion USD in sales over 2009 with more than 75% being repeat business. They sell shoes and clothing online. But as he points out, they actually sell customer service. It truly is at the heart of their business model. When you see their amazing level of customer service, it automatically makes me think of all the times I haven’t been treated well as a customer. I’ve been a loyal Vodafone customer for years. When I wanted the new Google Nexus phone, I called them. They told me they didn’t stock it and suggested I go somewhere else. That’s it. Nothing else. They didn’t ask me why I wanted the Nexus, suggest an alternative, point me in the right direction. See if they could help. They just told me to go elsewhere. That’s definitely not what I call good customer service. I ended up getting my free Google Nexus One phone through an online vendor. But guess what? I still prolonged my subscription with Vodafone. Smarter marketing: don’t advertise, help inform!! 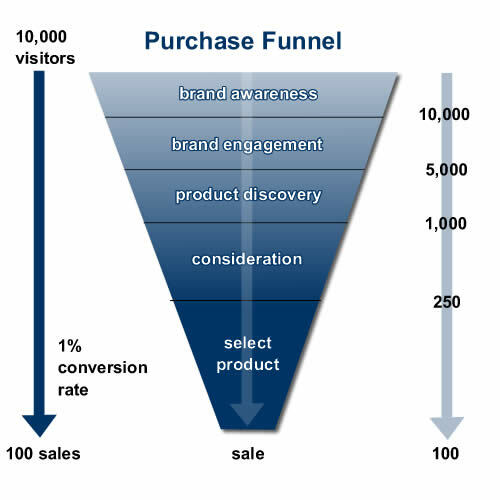 McKinsey change the purchase funnel! Everyone knows the purchase funnel gets narrower towards the end, right? The entire marketing process has been aligned to this principle for more than forty years. Well, now we can think again. McKinsey’s recent global study shows a definite change in the way consumers research and buy products. And that opens up ways of smarter marketing. McKinsey have replaced the traditional purchase funnel with the ‘Customer decision journey’. At the beginning of this journey, the consumer begins with an ‘Initial consideration set’ of brands or products. So far, so much the same.